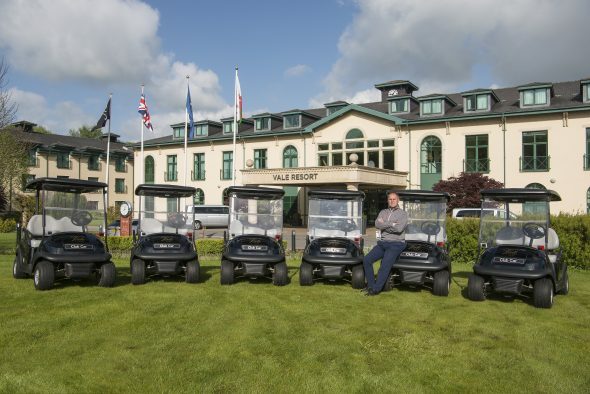 As part of its ongoing commitment to golfing excellence, the Vale Resort in south Wales has tee’d up a £200,000 investment to upgrade its golf buggy equipment. The resort, home to two championship golf courses, has purchased 50 new high-tech Club Car UK GPS buggies to give its members and thousands of visitors, an even better golfing experience in 2018. The new £4,000 buggies are installed with a state-of-the-art tablet-style device that can track a golfer’s progress on the course, tell them how far from the hole they are, as well as recommending which club to use. “The GPS in our buggies will help to improve the game of many golfers visiting the courses,” said Clive Coombs, the Vale Resort’s golf manager. “The real ‘hole in one’ feature though is the device’s ability to judge the distance between the golfer and the hole – something which can transform someone’s experience. Set in 650 acres of Welsh countryside, both courses have a mixture of wooded areas, wide and narrow fairways, and water features. At 7,433 yards off the championship tees, the Wales national is one of the longest courses in the UK, with the slightly shorter Lake course at 6,436 yards. “We’re committed to constantly improving the facilities on offer to our members and visitors – last year we invested £400,000 in our greens maintenance equipment to ensure our golf courses are presented to the highest standards, and have also just completed a £500,000 bedroom refurbishment.